they will be closed for 52 hours in September.... they will be rerouting the traffic to the next phase. here is the location of the building to get your tourist card/visa after the inspection station. Here is where I parked before. then walk back to the building I circled, it has a bank to pay also, and a nice washroom. It is not a dedicated parking area but they do not stop you from parking there. Just went south at new border crossing at San Ysidro and it was great. Hard right and hard left and a 31 foot RV was no problem. Got bumped into secondary no issues. Immigration you park just up ahead and walk back, very clean bathrooms at immigration. be in the middle lanes and in the nothing to declare be in the furthest to the right as you get past the red green go light park right after where I have the green x. Then walk back to the IMM office I have marked it is very safe parking there. then as you depart the signage is well marked and be in the right lane and first exit to the right. and as you go on this section of the border fence on the right do not pull over for any police, you are allowed to continue to the toll booth 10 miles ahead before you have to stop. Police are not to pull over americans or canadians on that stretch of the road. This was instituted by the Mayor of TJ because of fake pull overs. There are two turns you will need to make which I have documented with pictures on this forum somewhere. also I saw on the USA side a (pretty sure) Banomex so would be interesting to hear how the American branch interfaces with the Mexican one is someone is in the know. Rest of the road was in great shape and you can get all the way around the Wal-Mart Costco section of Ensenada going north by turning before them to the left right after the military base and follow that road around . Saves time and so many lights and so on. see the yellow lined area on the left. that is where the new location is. it is completed and open. Just a good birds eye view i why I posted it. .
a. We crossed the border on Thursday, early afternoon. Nothing new to add. After our SUV was inspected we drove to an uncovered parking area and were escorted to the offices which are on the right side of the inspection area. First stop is the "bank" where you fill out the FMM. They take US$ or pesos, enter data from the passport and print out two pages. Next go to the office where they keep one page and stamp the FMM. Very efficient - easier and quicker than the old border crossing. I talked to Doug M. who was with Tom S. as they were crossing the new El Chaparral border crossing this morning. Below is his report about how the crossing works. 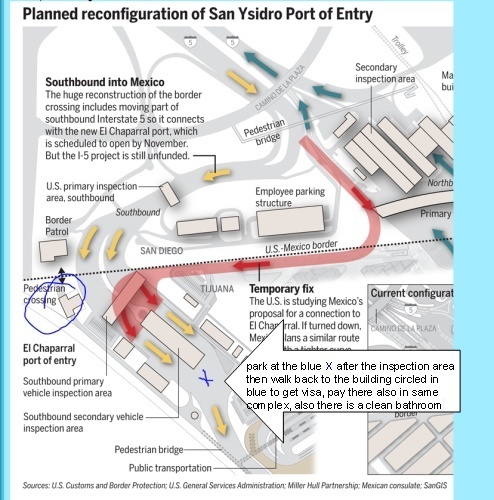 The new El Chaparral border crossing into Tijuana opened Thursday Nov. 1 2012 and is much easier to navigate and to take care of your FMM visa and bank fee than the old crossing. and 200 customs inspectors. To access the new border crossing from Hwy. 5 you will be directed to take a very sharp cubing 5 lane that curves from Hwy. 5 right at the border near the old crossing. 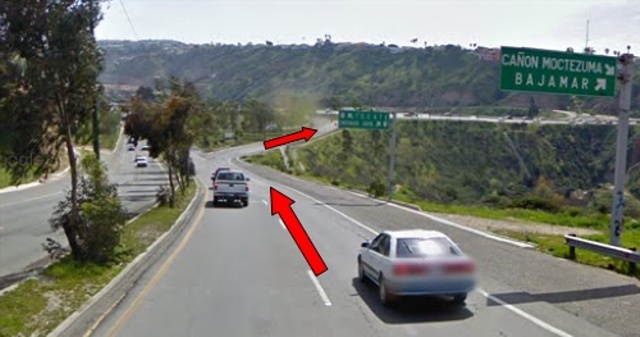 This road heads west for 0.2 miles parallel to the border inside of Mexico. Then it makes a left into the new border crossing which you can see in the bottom photo below. 2. Enter the building and walk pass the sign for saying Banco". Ahead you will see "Inmigración"
3. There fill out the FMM visa form. Take the completed form to the Banco and pay your $24.50 UDS or pesos. 4. Return to the "Inmigración" to get your form stamped. 5. Return to you car and leave. Doug reports that as of Nov. 4 there were no signs of the old green light red light inspection stop. 6. Leaving the crossing take the "A Playas de Tijuana, Rosarito Y Ensenada turn off over the dry river bed. This will merge with the old route running parallel to the border and on to Hwy 1D toll road to Ensenada. Well based on the latest from Baja Bound - that the immigration office at the new El Chaparral north to south crossing will not open until November 5th, I guess it is time to come up with “plan B”, since the old crossing with the immigration office and bank is now closed most of the time, and my wife and I are planning on crossing for our trip to Asuncion this Sunday November 4th. We have never crossed at Otay Mesa or Tecate – I have seen some posts about getting the FMM in Tecate, and my main question regarding that option is – is the bank in Tecate that is nearest the immigration office going to be open on Sunday to allow us to have our FMM validated (we plan to cross about mid-day Sunday)? 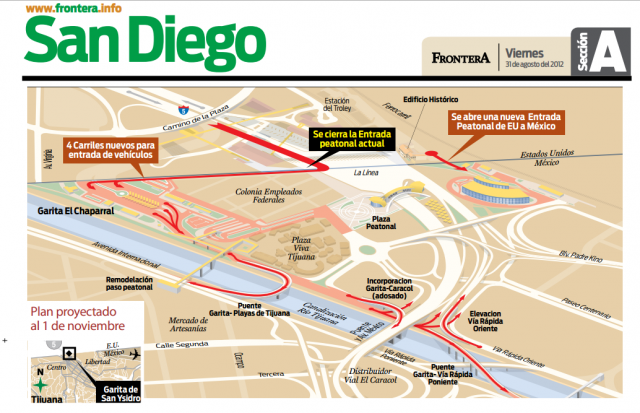 I have seen no prior Baja Nomad posts about getting the FMM at Otay Mesa – is it convenient and straight forward there (do you park in secondary as with the now closed San Ysidro crossing, is the immigration office close by and easy to find, and again is there a bank open on Sunday nearby, etc)? Then the other concern with this option is how easy or difficult is it to get from Otay Mesa through Tijuana to the toll road south, etc? Thanks in advance for any suggestions and help deciding on our “plan B”- it is much appreciated. another.. this is very good news for the future, on the maps I could see some parking after customs, so you will be able to park there after the 5th and walk back a short distance to the border to get your FMM documents. this should be much better for merging with the traffic, as the bridge appears to put you in the right side, vs the old way of merging into the fast lane. TIJUANA — Mexican customs inspectors processed passenger vehicles at the El Chaparral port of entry for the first time on Wednesday morning, seven days before its scheduled formal opening on Nov. 1. The new lanes are located west of the current southbound access lanes at Puerta Mexico. El Chaparral will triple the southbound inspection capacity of the world’s busiest land border crossing. At 11 a.m., Mexican customs inspectors stood at the end of Interstate 5 and waved southbound cars toward the new facility -- down a sharp curve at the end of the freeway that leads to Mexico’s five-lane access road running west along the U.S. border fence. Traffic at the new port was light at the time, and there were more inspectors than vehicles. Some of them waited at the secondary inspection station, carrying small hand-held computers in preparation for searching vehicles that received a red-light warning at the initial stop. 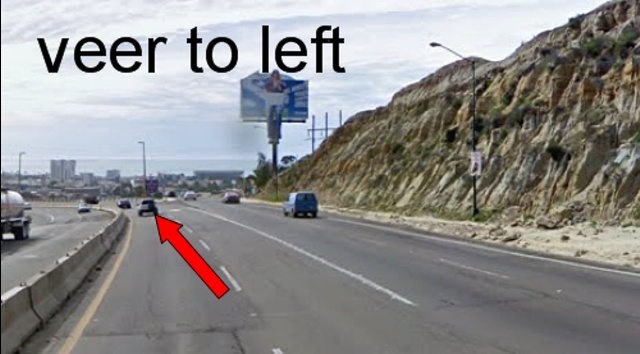 On the way out, new signs pointed the way to different parts of Tijuana. at the San Ysidro border crossing into Tijuana. The immigration office, which has been in the same location for the past four years, has apparently been moved. Previously located just inside the pedestrian gate leading from San Ysidro to Tijuana, it is now located down an outside sidewalk just to the south of the old office. When we knocked on the old office door, someone stuck their head out of the adjacent gate, saw our passports, and beckoned us to follow him down the sidewalk. also a quick note to get back to this site if you are traveling, all you have to do is type www.la-ventana.info and you get to the first page. that is la hyphen ventana.info then go to travel, by land. and remember almost all mcDonalds have free internet on the road as well as starbucks in the USA. 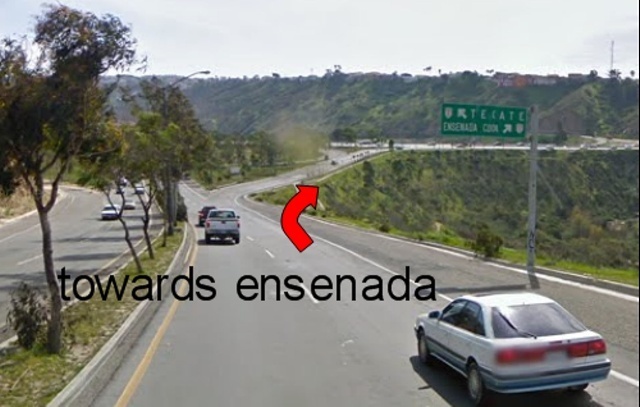 as you leave the inspection areas take a right turn it is well marked, this will merge you into the road to ensenada coast HW1. Remember do not stop on this road till you hit a toll booth if a police officer is trying to pull you over. going down the hill as shown with the arrow. hill and take this right. on the correct road after this. 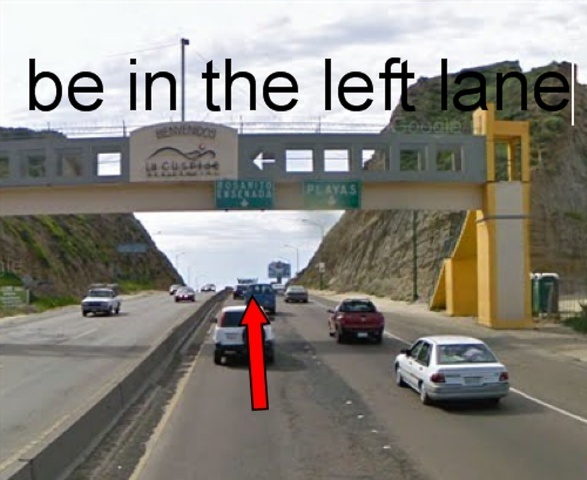 directions from TJ -San Ysidro border to ensenada for intelligent people... not for dummies. 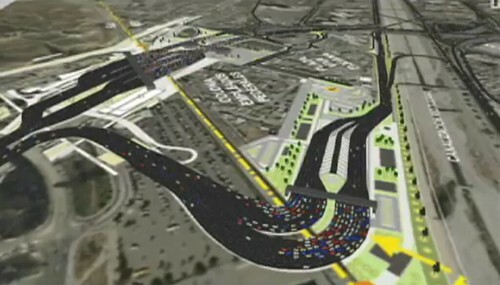 Here is the general map of TJ crossing at 5. A general rule I have read is first only cross during daylight. and second do not stop after you have exited the customs area for anything. I have read this: (so it is your choice to decide what you would do, but I will tell you this is what I would do) If a police car or police lights are pulling you over in this section, for your safety you do not stop till you are at the first toll booth. 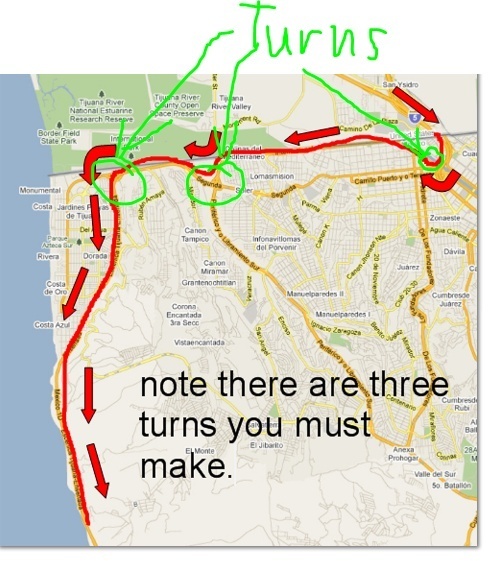 there are three turns you must make (noted with the red curved arrows) and they are easy if you have this information.... thanks to google for these pictures.